A Japanese sword (日本刀, nihontō) is one of several types of traditionally made swords from Japan. Swords have been made from as early as the Kofun period, though generally "Japanese swords" refer to the curved blades made after the Heian period. There are many types of Japanese swords that differ by size, shape, field of application and method of manufacture. Some of the more commonly known types of Japanese swords are the katana, wakizashi, odachi, and tachi. The type classifications for Japanese swords indicate the combination of a blade and its mounts as this, then, determines the style of use of the blade. An unsigned and shortened blade that was once made and intended for use as a tachi may be alternately mounted in tachi koshirae and katana koshirae. It is properly distinguished, then, by the style of mount it currently inhabits. A long tanto may be classified as a wakizashi due to its length being over 30 cm, however it may have originally been mounted and used as a tanto making the length distinction somewhat arbitrary but necessary when referring to unmounted short blades. When the mounts are taken out of the equation, a tanto and wakizashi will be determined by length under or over 30 cm unless their intended use can be absolutely determined or the speaker is rendering an opinion on the intended use of the blade. In this way, a blade formally attributed as a wakizashi due to length may be informally discussed between individuals as a tanto because the blade was made during an age where tanto were popular and the wakizashi as a companion sword to katana did not yet exist. Chokutō (直刀, "straight sword"): A straight single edged sword that was produced prior to the 10th century, and without differential hardening or folding. Tsurugi/Ken (剣, "sword"): A straight two edged sword that was produced prior to the 10th century, and may be without differential hardening or folding. Tachi (太刀, "long sword"): A sword that is generally longer and more curved than the later katana, with curvature often centered from the middle or towards the tang, and often including the tang. Tachi were worn suspended, with the edge downward. The tachi was in vogue before the 15th century. Kodachi (小太刀, "small Tachi"): A shorter version of the tachi, but with similar mounts and intended use, mostly found in the 13th century or earlier. Ōdachi (大太刀, "big Tachi")/Nodachi (野太刀, "field Tachi"): Very large tachi, some in excess of 100 cm, and usually a blade of the late 14th century. Uchigatana (打刀, "striking sword"): A development from the tachi in the 15th century. Worn with the edge upwards in the obi. Katate-uchi (片手打ち, "one handed strike"): A short type of uchigatana developed in the 16th century, with short tang, intended for one handed use. One of the forerunners of the wakizashi. Katana (刀, "sword"): A general term for the traditional sword with a curved blade longer than 60 cm (there is no upper length limit but generally they are shorter than 80 cm), worn with the edge upwards in the sash. Developed from the uchigatana and the sword of the samurai class of the Edo period (1600s to late 19th century). Wakizashi (脇差, "side inserted [sword]"): A general term for a sword between one and two shaku long (30 cm and 60 cm in modern measurement), predominantly made after 1600. Generally it is the short blade that accompanies a katana in the traditional samurai daisho pairing of swords, but may be worn by classes other than the samurai as a single blade, also worn edge up as the katana. The name derives from the way the sword would be stuck at one's side through the obi (sash/belt). Nagamaki (長巻, "long wrapping"): A polearm similar to a naginata, but with a straighter blade, more like that of a tachi or katana, and mounted with a wrapped handle similar to a highly exaggerated katana handle. The name refers to the style of mount as well as a blade type which means that a naginata blade could be mounted in a nagamaki mount and be considered a nagamaki. Naginata (なぎなた, 薙刀): A polearm with a curved single-edged blade. Naginata mounts consist of a long wooden pole, different from a nagamaki mount, which is shorter and wrapped. Yari (槍, "spear"): A spear, or spear-like polearm. Yari have various blade forms, from a simple double edged and flat blade, to a triangular cross section double edged blade, to those with a symmetric cross-piece (jumonji-yari) or those with an asymmetric cross piece. The main blade is symmetric and straight unlike a naginata, and usually smaller but can be as large or bigger than some naginata blades. Tantō (短刀, "short sword"): A knife or dagger with a blade shorter than 30 cm. Usually one-edged, but some were double-edged, though asymmetrical. 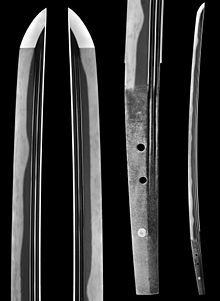 Ken (剣, "sword"): Usually a tanto or wakizashi length religious or ceremonial blade, with a gentle leaf shape and point, but some may be larger and can also refer to old pre-curve types of swords as above. Symmetrical and double edged. Arrowheads for war, yajiri (or yanone). Kogatana (小刀, "small blade"): An accessory or utility knife, sometimes found mounted in a pocket on the side of the scabbard of a sword. A typical blade is about 10 cm long and 1 cm wide, and is made using the same techniques as the larger sword blades. Also referred to as a "Kozuka" (小柄), which literally means 'small handle', but this terminology can also refer to the handle and the blade together. In entertainment media, the kogatana is sometimes shown as a throwing weapon, but its real purpose was the same as a 'pocket knife' in the West. A range of Japanese blade types, from left to right: naginata, ken, tantō, uchigatana and tachi (not to scale). In modern times the most commonly known type of Japanese sword is the Shinogi-Zukuri katana, which is a single-edged and usually curved longsword traditionally worn by samurai from the 15th century onwards. Other types of Japanese swords include: tsurugi or ken, which is a double-edged sword; ōdachi, tachi, which are older styles of a very long single-edged sword; wakizashi, a medium-sized sword and tantō which is an even smaller knife-sized sword. Naginata and yari despite being polearms are still considered to be swords. Japanese swords are still commonly seen today, antique and modern forged swords can easily be found and purchased. Modern, authentic nihontō are made by a few hundred swordsmiths. Many examples can be seen at an annual competition hosted by the All Japan Swordsmith Association, under the auspices of the Nihontō Bunka Shinkō Kyōkai (Society for the promotion of Japanese Sword Culture). Western historians have said that Japanese katana were among the finest cutting weapons in world military history, for their intended use. The word katana was used in ancient Japan and is still used today, whereas the old usage of the word nihontō is found in the poem, the Song of Nihontō, by the Song dynasty poet Ouyang Xiu. The word nihontō became more common in Japan in the late Tokugawa shogunate. Due to importation of Western swords, the word nihontō was adopted in order to distinguish it from the Western sword (洋刀, yōtō). Meibutsu (noted swords) is a special designation given to sword masterpieces which are listed in a compilation from the 18th century called the "Kyoho Meibutsucho". The swords listed are Koto blades from several different provinces, 100 of the 166 swords listed are known to exist today with Soshu blades being very well represented. The "Kyoho Meibutsucho" also listed the nicknames, prices, history and length of the Meibutsu with swords by Yoshimitsu, Masamune, Yoshihiro, and Sadamune being very highly priced. Each blade has a unique profile, mostly dependent on the swordsmith and the construction method. The most prominent part is the middle ridge, or shinogi. In the earlier picture, the examples were flat to the shinogi, then tapering to the blade edge. However, swords could narrow down to the shinogi, then narrow further to the blade edge, or even expand outward towards the shinogi then shrink to the blade edge(producing a trapezoidal shape). A flat or narrowing shinogi is called shinogi-hikushi, whereas a flat blade is called a shinogi-takushi. The shinogi can be placed near the back of the blade for a longer, sharper, more fragile tip or a more moderate shinogi near the center of the blade. The sword also has an exact tip shape, which is considered an extremely important characteristic: the tip can be long (ōkissaki), medium (chūkissaki), short (kokissaki), or even hooked backwards (ikuri-ōkissaki). In addition, whether the front edge of the tip is more curved (fukura-tsuku) or (relatively) straight (fukura-kareru) is also important. The kissaki (point) is not a "chisel-like" point, nor is the Western knife interpretation of a "tantō point" found on true Japanese swords; a straight, linearly sloped point has the advantage of being easy to grind, but it bears only a superficial similarity to traditional Japanese kissaki. Kissaki have a curved profile, and smooth three-dimensional curvature across their surface towards the edge—though they are bounded by a straight line called the yokote and have crisp definition at all their edges. Although it is not commonly known, the "chisel point" kissaki originated in Japan. Examples of such are shown in the book "The Japanese Sword" by Kanzan Sato. Because American bladesmiths use this design extensively it is a common misconception that the design originated in America. A hole is punched through the tang nakago, called a mekugi-ana. It is used to anchor the blade using a mekugi, a small bamboo pin that is inserted into another cavity in the handle tsuka and through the mekugi-ana, thus restricting the blade from slipping out. To remove the handle one removes the mekugi. The swordsmith's signature mei is carved on the tang. In Japanese, the scabbard is referred to as a saya, and the handguard piece, often intricately designed as an individual work of art—especially in later years of the Edo period—was called the tsuba. Other aspects of the mountings (koshirae), such as the menuki (decorative grip swells), habaki (blade collar and scabbard wedge), fuchi and kashira (handle collar and cap), kozuka (small utility knife handle), kogai (decorative skewer-like implement), saya lacquer, and tsuka-ito (professional handle wrap, also named tsukamaki), received similar levels of artistry. A pair of examples of chiseled signatures (mei) on the tangs of a katana (top); and tachi (bottom). The mei is the signature inscribed on to the tang of the Japanese sword. Fake signatures ("gimei") are common not only due to centuries of forgeries but potentially misleading ones that acknowledge prominent smiths and guilds, and those commissioned to a separate signer. to identify the mei, the hilt is removed and the sword is held point side up. The mei is chiseled onto the tang on the side which traditionally faces away from the wearer's body while being worn; since the katana and wakizashi are always worn with the cutting-edge up, the edge should be held to the viewer's left. The inscription will be viewed as kanji on the surface of the tang: the first two kanji represent the province; the next pair is the smith; and the last, when present, is sometimes a variation of 'made by', or, 'respecfully'. The date will be inscribed near the mei, either with the reign name; the Zodiacal Method; or those calculated from the reign of the legendary Emperor Jimmu, dependent upon the period. Four katana and one wakizashi blades from the Musée Guimet, Paris., illustrating the difference in curvature and length between the katana and the wakizashi (bottom blade). What generally differentiates the different swords is their length. Japanese swords are measured in units of shaku. Since 1891, the modern Japanese shaku is approximately equal to a foot (11.93 inches), calibrated with the meter to equal exactly 10 meters per 33 shaku (30.30 cm). However the historical shaku was slightly longer (13.96 inches or 35.45 cm). Thus, there may sometimes be confusion about the blade lengths, depending on which shaku value is being assumed when converting to metric or U.S. customary measurements. 1 shaku or less for tantō (knife or dagger). 1–2 shaku for Shōtō (小刀:しょうとう) (wakizashi or kodachi). 2 shaku or more for daitō (大刀) (long sword, such as katana or tachi). A blade shorter than one shaku is considered a tantō (knife). A blade longer than one shaku but less than two is considered a shōtō (short sword). The wakizashi and kodachi are in this category. The length is measured in a straight line across the back of the blade from tip to munemachi (where blade meets tang). Most blades that fall into the "shōtō" size range are wakizashi. However, some daitō were designed with blades slightly shorter than 2 shaku. These were called kodachi and are somewhere in between a true daitō and a wakizashi. A shōtō and a daitō together are called a daishō (literally, "big-little"). The daishō was the symbolic armament of the Edo period samurai. A blade longer than two shaku is considered a daitō, or long sword. To qualify as a daitō the sword must have a blade longer than 2 shaku (approximately 24 inches or 60 centimeters) in a straight line. While there is a well defined lower-limit to the length of a daitō, the upper limit is not well enforced; a number of modern historians, swordsmiths, etc. say that swords that are over 3 shaku in blade length are "longer than normal daitō" and are usually referred to or called ōdachi. The word "daitō" is often used when explaining the related terms shōtō (short sword) and daishō (the set of both large and small sword). Miyamoto Musashi refers to the long sword in The Book of Five Rings. He is referring to the katana in this, and refers to the nodachi and the odachi as "extra-long swords". Before about 1500 most swords were usually worn suspended from cords on a belt, edge-down. This style is called jindachi-zukuri, and daitō worn in this fashion are called tachi (average blade length of 75–80 cm). From 1600 to 1867, more swords were worn through an obi (sash), paired with a smaller blade; both worn edge-up. This style is called buke-zukuri, and all daitō worn in this fashion are katana, averaging 70–74 cm (2 shaku 3 sun to 2 shaku 4 sun 5 bu) in blade length. However, nihontō of longer lengths also existed, including lengths up to 78 cm (2 shaku 5 sun 5 bu). It was not simply that the swords were worn by cords on a belt, as a 'style' of sorts. Such a statement trivializes an important function of such a manner of bearing the sword. It was a very direct example of 'form following function.' At this point in Japanese history, much of the warfare was fought on horseback. Being so, if the sword or blade were in a more vertical position, it would be cumbersome, and awkward to draw. Suspending the sword by 'cords,' allowed the sheath to be more horizontal, and far less likely to bind while drawing it in that position. Abnormally long blades (longer than 3 shaku), usually carried across the back, are called ōdachi or nodachi. The word ōdachi is also sometimes used as a synonym for nihontō. Odachi means "great sword", and Nodachi translates to "field sword". These greatswords were used during war as the longer sword gave a foot soldier a reach advantage. These swords are now illegal  in Japan. Citizens are not allowed to possess an odachi unless it is for ceremonial purposes. Blades whose length is next to a different classification type are described with a prefix 'O-' (for great) or 'Ko-' (for small), e.g. a Wakizashi with a length of 59 cm is called an O-wakizashi (almost a Katana) whereas a Katana with 61 cm is called a Ko-Katana (for small Katana; but note that a small accessory blade sometimes found in the sheath of a long sword is also a "kogatana" (小刀)). Since 1867, restrictions and/or the deconstruction of the samurai class meant that most blades have been worn jindachi-zukuri style, like Western navy officers. Since 1953, there has been a resurgence in the buke-zukuri style, permitted only for demonstration purposes. Sōshū School, known for itame hada and midareba hamon in nie deki. Yamato School, known for masame hada and suguha hamon in nie deki. Bizen School, known for mokume hada and midareba hamon in nioi deki. Yamashiro School, known for mokume hada and suguha hamon in nei deki. Mino School, known for hard mokume hada and midareba mixed with togari-ba. In the Kotō era there were several other schools that did not fit within the Five Traditions or were known to mix elements of each Gokaden, and they were called wakimono (small school). There were 19 commonly referenced wakimono. The production of swords in Japan is divided into specific time periods: jokoto (ancient swords, until around 900 A.D.), koto (old swords from around 900–1596), shinto (new swords 1596–1780), shinshinto (new new swords 1781–1876), gendaito (modern swords 1876–1945), and shinsakuto (newly made swords 1953–present). Tachi by Norishige ca. 1300 CE, made ō-suriage (greatly shortened) during the Edo period for use as a "katana" by cutting off the original tang and reforming it higher up the cutting edge. Early examples of swords were straight chokutō or jōkotō and others with unusual shapes, some of styles and techniques probably are derived from Chinese swords, and some of them are directly imported through trade. Swords forged between 987 and 1597 are called kotō (古刀) (lit., "old swords"); these are considered the pinnacle of Japanese swordcraft. Early models had uneven curves with the deepest part of the curve at the hilt. As eras changed the center of the curve tended to move up the blade. The predecessor of the Japanese sword has been called "Warabite sword(ja:蕨手刀)", It had been manufactured by Emishi persons in Tōhoku region. In the middle of the Heian period, samurai improved on the Warabite to develop Kenukigatatati (ja:毛抜形太刀) -early Japanese sword-. The Japanese sword known today with its deep, graceful curve has its origin in shinogi-zukuri (single-edged blade with ridgeline) tachi which were developed sometime around the middle of the Heian period to service the need of the growing military class. Its shape reflects the changing form of warfare in Japan. Cavalry were now the predominant fighting unit and the older straight chokutō were particularly unsuitable for fighting from horseback. The curved sword is a far more efficient weapon when wielded by a warrior on horseback where the curve of the blade adds considerably to the downward force of a cutting action. The tachi is a sword which is generally larger than a katana, and is worn suspended with the cutting edge down. This was the standard form of carrying the sword for centuries, and would eventually be displaced by the katana style where the blade was worn thrust through the belt, edge up. The tachi was worn slung across the left hip. The signature on the tang of the blade was inscribed in such a way that it would always be on the outside of the sword when worn. This characteristic is important in recognizing the development, function, and different styles of wearing swords from this time onwards. When worn with full armour, the tachi would be accompanied by a shorter blade in the form known as koshigatana ("waist sword"); a type of short sword with no handguard, and where the hilt and scabbard meet to form the style of mounting called an aikuchi ("meeting mouth"). Daggers (tantō), were also carried for close combat fighting as well as carried generally for personal protection. The Mongol invasions of Japan in the 13th century spurred further evolution of the Japanese sword. Often forced to abandon traditional mounted archery for hand-to-hand combat, many samurai found that their swords were too delicate and prone to damage when used against the thick leather armor of the invaders. In response, Japanese swordsmiths started to adopt thinner and simpler temper lines. Certain Japanese swordsmiths of this period began to make blades with thicker backs and bigger points as a response to the Mongol threat. By the 15th century, the Sengoku Jidai civil war erupted, and the vast need for swords together with the ferocity of the fighting caused the highly artistic techniques of the Kamakura period (known as the "Golden Age of Swordmaking") to be abandoned in favor of more utilitarian and disposable weapons. The export of nihontō reached its height during the Muromachi period when at least 200,000 swords were shipped to Ming Dynasty China in official trade in an attempt to soak up the production of Japanese weapons and make it harder for pirates in the area to arm. In the 15th and 16th centuries, samurai who increasingly found a need for a sword for use in closer quarters along with increasing use of foot-soldiers armed with spears led to the creation of the uchigatana, in both one-handed and two-handed forms. As the Sengoku civil wars progressed, the uchigatana evolved into the modern katana, and replaced the tachi as the primary weapon of the samurai, especially when not wearing armor. Many longer tachi were shortened in the 15th–17th centuries to meet the demand for katana. The craft decayed as time progressed and firearms were introduced as a decisive force on the battlefield. At the end of the Muromachi period, the Tokugawa shōguns issued regulations controlling who could own and carry swords, and effectively standardized the description of a nihontō. In times of peace, swordsmiths returned to the making of refined and artistic blades, and the beginning of the Momoyama period saw the return of high quality creations. As the techniques of the ancient smiths had been lost during the previous period of war, these swords were called shintō (新刀), literally "new swords". Generally they are considered inferior[by whom?] to most kotō ("old swords"), and coincide with a decline in manufacturing skills. As the Edo period progressed, blade quality declined, though ornamentation was refined. Originally, simple and tasteful engravings known as horimono were added for religious reasons. Later, in the more complex work found on many shintō, form no longer strictly followed function. Under the Tokugawa shogunate, swordmaking and the use of firearms declined. The master swordsmith Suishinshi Masahide (c. 1750–1825) published opinions that the arts and techniques of the shintō swords were inferior to the kotō blades, and that research should be made by all swordsmiths to rediscover the lost techniques. Masahide traveled the land teaching what he knew to all who would listen, and swordsmiths rallied to his cause and ushered in a second renaissance in Japanese sword smithing . With the discarding of the shintō style, and the re-introduction of old and rediscovered techniques, swords made in the kotō style between 1761 and 1876 are shinshintō (新新刀), "new revival swords" or literally "new-new swords." These are considered superior to most shintō, but inferior to true kotō. The arrival of Matthew Perry in 1853 and the subsequent Convention of Kanagawa forcibly reintroduced Japan to the outside world; the rapid modernization of the Meiji Restoration soon followed. The Haitōrei Edict in 1876 all but banned carrying swords and guns on streets. Overnight, the market for swords died, many swordsmiths were left without a trade to pursue, and valuable skills were lost. The nihontō remained in use in some occupations such as the police force. At the same time, kendo was incorporated into police training so that police officers would have at least the training necessary to properly use one. In time, it was rediscovered that soldiers needed to be armed with swords, and over the decades at the beginning of the 20th century swordsmiths again found work. These swords, derisively called guntō, were often oil-tempered, or simply stamped out of steel and given a serial number rather than a chiseled signature. The mass-produced ones often look like Western cavalry sabers rather than nihontō, with blades slightly shorter than blades of the shintō and shinshintō periods. Military swords hand made in the traditional way are often termed as gendaitō. The craft of making swords was kept alive through the efforts of a few individuals, notably Gassan Sadakazu (月山貞一, 1836–1918) and Gassan Sadakatsu (月山貞勝, 1869–1943), who were employed as Imperial artisans. These smiths produced fine works that stand with the best of the older blades for the Emperor and other high-ranking officials. The students of Sadakatsu went on to be designated Intangible Cultural Assets, "Living National Treasures," as they embodied knowledge that was considered to be fundamentally important to the Japanese identity. In 1934 the Japanese government issued a military specification for the shin guntō (new army sword), the first version of which was the Type 94 Katana, and many machine- and hand-crafted swords used in World War II conformed to this and later shin guntō specifications. "Type 95" Non Commissioned Officer's sword of World War II; made to resemble a Commissioned Officer's shin guntō. World War II Japanese naval officers sword kai gunto. Under the United States occupation at the end of World War II all armed forces in occupied Japan were disbanded and production of nihontō with edges was banned except under police or government permit. The ban was overturned through a personal appeal by Dr. Junji Honma. During a meeting with General Douglas MacArthur, Honma produced blades from the various periods of Japanese history and MacArthur was able to identify very quickly what blades held artistic merit and which could be considered purely weapons. As a result of this meeting, the ban was amended so that guntō weapons would be destroyed while swords of artistic merit could be owned and preserved. Even so, many nihontō were sold to American soldiers at a bargain price; in 1958 there were more Japanese swords in America than in Japan. The vast majority of these one million or more swords were guntō, but there were still a sizable number of older swords. 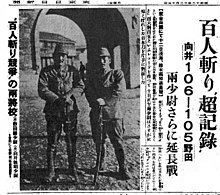 Two Japanese officers in occupied China competing to see who could kill (with a sword) one hundred people first. After the Edo period, swordsmiths turned increasingly to the production of civilian goods. The Occupation and its regulations almost put an end to the production of nihonto. A few smiths continued their trade, and Honma went on to be a founder of the Society for the Preservation of the Japanese Sword (日本美術刀剣保存協会, Nippon Bijutsu Tōken Hozon Kyōkai), who made it their mission to preserve the old techniques and blades. 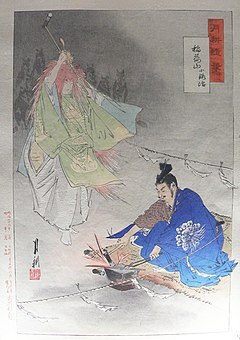 Thanks to the efforts of other like-minded individuals, the nihontō did not disappear, many swordsmiths continued the work begun by Masahide, and the old swordmaking techniques were rediscovered. Modern swords manufactured according to traditional methods are usually known as shinsakutō (新作刀), meaning "newly made swords". Alternatively, they can be termed shinken (真剣) when they are designed for combat as opposed to iaitō training swords. Due to their popularity in modern media, display-only "nihontō" have become widespread in the sword marketplace. Ranging from small letter openers to scale replica "wallhangers", these items are commonly made from stainless steel (which makes them either brittle (if made from cutlery-grade 400-series stainless steel) or poor at holding an edge (if made from 300-series stainless steel)) and have either a blunt or very crude edge. There are accounts of good quality stainless steel nihontō, however, these are rare at best. Some replica nihontō have been used in modern-day armed robberies, which helped contribute to the enactment of a ban on sale, import and hire of samurai swords in the UK. As a part of marketing, modern ahistoric blade styles and material properties are often stated as traditional and genuine, promulgating disinformation. In Japan, genuine edged hand-made Japanese swords, whether antique or modern, are classified as art objects (and not weapons) and must have accompanying certification in order to be legally owned. Some companies and independent smiths outside Japan produce katana as well, with varying levels of quality. Blacksmith Munechika (end of the 10th century), helped by a fox spirit, forging the blade kogitsune-maru ("Little fox"). The spirit is represented by a woman surrounded by foxes. Engraving by Ogata Gekkō (1859–1920), 1873. Japanese swords were often forged with different profiles, different blade thicknesses, and varying amounts of grind. Wakizashi, for instance, were not simply scaled-down versions of katana; they were often forged in hira-zukuri or other such forms which were very rare on other swords. The daishō was not always forged together. If a samurai was able to afford a daishō, it was often composed of whichever two swords could be conveniently acquired, sometimes by different smiths and in different styles. Even when a daishō contained a pair of blades by the same smith, they were not always forged as a pair or mounted as one. Daishō made as a pair, mounted as a pair, and owned/worn as a pair, are therefore uncommon and considered highly valuable, especially if they still retain their original mountings (as opposed to later mountings, even if the later mounts are made as a pair). The forging of a Japanese blade typically took weeks or even months and was considered a sacred art. As with many complex endeavors, rather than a single craftsman, several artists were involved. There was a smith to forge the rough shape, often a second smith (apprentice) to fold the metal, a specialist polisher (called a togi) as well as the various artisans that made the koshirae (the various fittings used to decorate the finished blade and saya (sheath) including the tsuka (hilt), fuchi (collar), kashira (pommel), and tsuba (hand guard)). It is said that the sharpening and polishing process takes just as long as the forging of the blade itself. 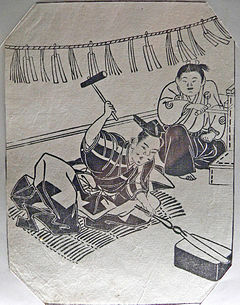 Engraving from the Edo period depicting forge scenes. The legitimate Japanese sword is made from Japanese steel "Tamahagane". The most common lamination method the Japanese sword blade is formed from is a combination of two different steels: a harder outer jacket of steel wrapped around a softer inner core of steel. This creates a blade which has a hard, razor sharp cutting edge with the ability to absorb shock in a way which reduces the possibility of the blade breaking when used in combat. The hadagane, for the outer skin of the blade, is produced by heating a block of raw steel, which is then hammered out into a bar, and the flexible back portion. This is then cooled and broken up into smaller blocks which are checked for further impurities and then reassembled and reforged. During this process the billet of steel is heated and hammered, split and folded back upon itself many times and re-welded to create a complex structure of many thousands of layers. Each different steel is folded differently, in order to provide the necessary strength and flexibility to the different steels. 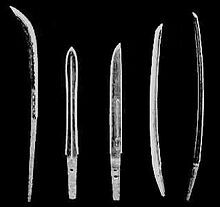 The precise way in which the steel is folded, hammered and re-welded determines the distinctive grain pattern of the blade, the jihada, (also called jigane when referring to the actual surface of the steel blade) a feature which is indicative of the period, place of manufacture and actual maker of the blade. The practice of folding also ensures a somewhat more homogeneous product, with the carbon in the steel being evenly distributed and the steel having no voids that could lead to fractures and failure of the blade in combat. 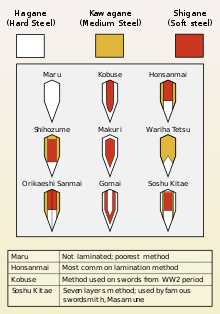 Cross sections of Japanese sword blades showing lamination types. The shingane (for the inner core of the blade) is of a relatively softer steel with a lower carbon content than the hadagane. For this, the block is again hammered, folded and welded in a similar fashion to the hadagane, but with fewer folds. At this point, the hadagane block is once again heated, hammered out and folded into a ‘U’ shape, into which the shingane is inserted to a point just short of the tip. The new composite steel billet is then heated and hammered out ensuring that no air or dirt is trapped between the two layers of steel. The bar increases in length during this process until it approximates the final size and shape of the finished sword blade. A triangular section is cut off from the tip of the bar and shaped to create what will be the kissaki. At this point in the process, the blank for the blade is of rectangular section. This rough shape is referred to as a sunobe. The sunobe is again heated, section by section and hammered to create a shape which has many of the recognisable characteristics of the finished blade. These are a thick back (mune), a thinner edge (ha), a curved tip (kissaki), notches on the edge (hamachi) and back (munemachi) which separate the blade from the tang (nakago). Details such as the ridge line (shinogi) another distinctive characteristic of the Japanese sword, are added at this stage of the process. The smith's skill at this point comes into play as the hammering process causes the blade to naturally curve in an erratic way, the thicker back tending to curve towards the thinner edge, and he must skillfully control the shape to give it the required upward curvature. The sunobe is finished by a process of filing and scraping which leaves all the physical characteristics and shapes of the blade recognisable. The surface of the blade is left in a relatively rough state, ready for the hardening processes. The sunobe is then covered all over with a clay mixture which is applied more thickly along the back and sides of the blade than along the edge. The blade is left to dry while the smith prepares the forge for the final heat treatment of the blade, the yaki-ire, the hardening of the cutting edge. This process takes place in a darkened smithy, traditionally at night, in order that the smith can judge by eye the colour and therefore the temperature of the sword as it is repeatedly passed through the glowing charcoal. When the time is deemed right (traditionally the blade should be the colour of the moon in February and August which are the two months that appear most commonly on dated inscriptions on the tang), the blade is plunged edge down and point forward into a tank of water. The precise time taken to heat the sword, the temperature of the blade and of the water into which it is plunged are all individual to each smith and they have generally been closely guarded secrets. Legend tells of a particular smith who cut off his apprentice's hand for testing the temperature of the water he used for the hardening process. In the different schools of swordmakers there are many subtle variations in the materials used in the various processes and techniques outlined above, specifically in the form of clay applied to the blade prior to the yaki-ire, but all follow the same general procedures. The application of the clay in different thicknesses to the blade allows the steel to cool more quickly along the thinner coated edge when plunged into the tank of water and thereby develop into the harder form of steel called martensite, which can be ground to razor-like sharpness. The thickly coated back cools more slowly retaining the pearlite steel characteristics of relative softness and flexibility. The precise way in which the clay is applied, and partially scraped off at the edge, is a determining factor in the formation of the shape and features of the crystalline structure known as the hamon. This distinctive tempering line found near the edge is one of the main characteristics to be assessed when examining a blade. The martensitic steel which forms from the edge of the blade to the hamon is in effect the transition line between these two different forms of steel, and is where most of the shapes, colours and beauty in the steel of the Japanese sword are to be found. The variations in the form and structure of the hamon are all indicative of the period, smith, school or place of manufacture of the sword. As well as the aesthetic qualities of the hamon, there are, perhaps not unsurprisingly, real practical functions. The hardened edge is where most of any potential damage to the blade will occur in battle. This hardened edge is capable of being reground and sharpened many times, although the process will alter the shape of the blade. Altering the shape will allow more resistance when fighting in hand-to-hand combat. Almost all blades are decorated, although not all blades are decorated on the visible part of the blade. Once the blade is cool, and the mud is scraped off, grooves and markings (hi or bo-hi) may be cut into it. One of the most important markings on the sword is performed here: the file markings. These are cut into the tang or the hilt-section of the blade, where they will be covered by the hilt later. The tang is never supposed to be cleaned; doing this can reduce the value of the sword by half or more. The purpose is to show how well the steel ages. Some other marks on the blade are aesthetic: dedications written in Kanji characters as well as engravings called horimono depicting gods, dragons, or other acceptable beings. Some are more practical. The presence of a groove (the most basic type is called a hi) reduces the weight of the sword yet keeps its structural integrity and strength. The tachi became the primary weapon on the battlefield during the Kamakura period, used by cavalry. The sword was mostly considered as a secondary weapon until then, used in the battlefield only after the bow and polearm were no longer feasible. During the Edo period samurai went about on foot unarmored, and with much less combat being fought on horseback in open battlefields the need for an effective close quarter weapon resulted in samurai being armed with daishō. Testing of swords, called tameshigiri, was practiced on a variety of materials (often the bodies of executed criminals) to test the sword's sharpness and practice cutting technique. Kenjutsu is the Japanese martial art of using the nihontō in combat. The nihontō was primarily a cutting weapon, or more specifically, a slicing one. Its moderate curve, however, allowed for effective thrusting as well. The hilt was held with two hands, though a fair amount of one-handed techniques exist. The placement of the right hand was dictated by both the length of the handle and the length of the wielder's arm. Two other martial arts were developed specifically for training to draw the sword and attack in one motion. They are battōjutsu and iaijutsu, which are superficially similar, but do generally differ in training theory and methods. For cutting, there was a specific technique called "ten-uchi." Ten-uchi refers to an organized motion made by arms and wrist, during a descending strike. As the sword is swung downwards, the elbow joint drastically extends at the last instant, popping the sword into place. This motion causes the swordsman's grip to twist slightly and if done correctly, is said to feel like wringing a towel (Thomas Hooper reference). This motion itself caused the sword's blade to impact its target with sharp force, and is used to break initial resistance. From there, fluidly continuing along the motion wrought by ten-uchi, the arms would follow through with the stroke, dragging the sword through its target. Because the nihontō slices rather than chops, it is this "dragging" which allows it to do maximum damage, and is thus incorporated into the cutting technique. At full speed, the swing will appear to be full stroke, the sword passing through the targeted object. The segments of the swing are hardly visible, if at all. Assuming that the target is, for example, a human torso, ten-uchi will break the initial resistance supplied by shoulder muscles and the clavicle. The follow through would continue the slicing motion, through whatever else it would encounter, until the blade inherently exited the body, due to a combination of the motion and its curved shape. Koshiate (Sword Hangers). There are several varieties, especially of ryo-goshiate (double hangers). All kinds which are attached with cords will be worn in the same way, but there are two kinds which have no cords and are therefore worn differently. Swords may be carried without hangers by putting them between the folds of the obi. Nearly all styles of kenjutsu share the same five basic guard postures. They are as follows; chūdan-no-kamae (middle posture), jōdan-no-kamae (high posture), gedan-no-kamae (low posture), hassō-no-kamae (eight-sided posture), and waki-gamae (side posture). The nihontō's razor-edge was so hard that upon hitting an equally hard or harder object, such as another sword's edge, chipping became a definite risk. As such, blocking an oncoming blow blade-to-blade was generally avoided. In fact, evasive body maneuvers were preferred over blade contact by most, but, if such was not possible, the flat or the back of the blade was used for defense in many styles, rather than the precious edge. A popular method for defeating descending slashes was to simply beat the sword aside. In some instances, an "umbrella block", positioning the blade overhead, diagonally (point towards the ground, pommel towards the sky), would create an effective shield against a descending strike. If the angle of the block was drastic enough, the curve of the nihontō's blade would cause the attacker's blade to slide along its counter and off to the side. Japanese swords were carried in several different ways, varying throughout Japanese history. The style most commonly seen in "samurai" movies is called buke-zukuri, with the katana (and wakizashi, if also present) carried edge up, with the sheath thrust through the obi (sash). The sword would be carried in a sheath and tucked into the samurai's belt. Originally, they would carry the sword with the blade turned down. This was a more comfortable way for the armored samurai to carry his very long sword or to draw while mounted. The bulk of the samurai armor made it difficult to draw the sword from any other place on his body. When unarmored, samurai would carry their sword with the blade facing up. This made it possible to draw the sword and strike in one quick motion. In one such method of drawing the sword, the samurai would turn the sheath downward ninety degrees and pull it out of his sash just a bit with his left hand, then gripping the hilt with his right hand he would slide it out while sliding the sheath back to its original position. Hilts of wakizashi and katana. Nakago (tang) of a wakizashi blade, showing a habaki (blade collar). Kissaki (blade tip or point) of a tachi blade, Bizen school, signed Bizen Kuni Osafune Yoshikage; Northern and Southern Courts era (14th century). The habaki (blade collar) which locks the blade into the saya (scabbard). An Edo era wakizashi koshirae. This example omits any tsuka-ito (handle wrapping), showing bare stingray skin. Note the decoration of the saya. Elaborate Handguard of the Edo period. shirasaya (storage mounts), used to protect the blade when not mounted in a koshirae (formal mounts). ^ a b c d Nagayama, Kokan (1997). The Connoisseur's Book of Japanese Swords. Kodansha International. p. 49. ISBN 4-7700-2071-6. ^ 国語大辞典（新装版） [Nihon Kokugo Daijiten, Revised Edition] (in Japanese). Tokyo: Shogakukan. 1988. ^ a b Leon Kapp; Hiroko Kapp; Yoshindo Yoshihara (January 2002). Modern Japanese Swords and Swordsmiths: From 1868 to the Present. Kodansha International. p. 18. ISBN 978-4-7700-1962-2. ^ Suenaga, Masao (1975). Nihonto no Soe Kogatana (in Japanese). ^ Clive Sinclaire (1 November 2004). Samurai: The Weapons and Spirit of the Japanese Warrior. Lyons Press. pp. 40–58. ISBN 978-1-59228-720-8. ^ トム岸田 (24 September 2004). 靖国刀. Kodansha International. p. 42. ISBN 978-4-7700-2754-2. ^ Daniel Coit Gilman; Harry Thurston Peck; Frank Moore Colby, eds. (1906). "Sword". The New International Encyclopaedia. Dodd, Mead and company. p. 765. Retrieved 2007-12-19. ...one edged sword in general called a katana. ^ Robinson, B. W. (1961). The arts of the Japanese sword. Faber and Faber. p. 28. ^ "All Japan Swordsmith Association". Retrieved 2010-02-16. ^ Nihonto Bunka Shinko Kyokai Public Foundation: NBSK newsletter (September 2009) Archived 2010-12-13 at the Wayback Machine Retrieved 2010-02-16. ^ Stephen Turnbull (2012). Katana: The Samurai Sword. Osprey Publishing. p. 4. ISBN 9781849086585. ^ Roger Ford (2006). Weapon: A Visual History of Arms and Armor. DK Publishing. pp. 66, 120. ISBN 9780756622107. ^ The way to Kwan Yi is distant and not accessible anymore, the legend of its sword being able to cut jade is unbeatable. A treasured sword from the near country Japan (could be obtained easier), all you need to do is cross the sea to the east. The sheath is decorated by fish skin, the yellow and white parts are mixed by chalcopyrite and copper. A good help that could be bought by hundred gold, equipping it can dispel evil. Original script: 昆夷道遠不復通，世傳切玉誰能窮。寶刀近出日本國，越賈得之滄海東。魚皮裝貼香木鞘，黃白閒雜鍮與銅。百金傳入好事手，佩服可以禳妖凶。 see Chinese wikisource for full script. ^ Nagayama, Kōkan (1998). The connoisseur's book of Japanese swords. Tokyo: Kodansha International. p. 31. ^ Gilbertson, E.; Kowaki, G. (1892). The Genealogy of the Miochin Family: Armourers, Sword- smiths and Artists in Iron, Twelfth to the Eighteenth Century. London: Transactions and Proceedings of the Japan Society. ^ Ratti, Oscar; Adele Westbrook (1991). Secrets of the Samurai: The Martial Arts of Feudal Japan. Tuttle Publishing. p. 484. ISBN 978-0-8048-1684-7. ^ Schiller, Guido. The Japanese Sword Law & Export/Import of Swords Into/Out of Japan (PDF). ^ Stone, George Cameron (1999) . A Glossary of the Construction, Decoration, and Use of Arms and Armor in All Countries and in All Times. Mineola NY: Dover Publications. p. 314. ISBN 0-486-40726-8. ^ Nagayama, Kokan (1997). The Connoisseur's Book of Japanese Swords. Kodansha International. p. 217. ISBN 4-7700-2071-6. ^ Sinclaire, Clive (2004). Samurai: The Weapons And Spirit Of The Japanese Warrior. Globe Pequot. pp. 40–58. ISBN 978-1-59228-720-8. ^ Kishida, Tom; Mishina, Kenji (2004). [The Yasukuni Swords: Rare Weapons of Japan, 1933–1945 The Yasukuni Swords: Rare Weapons of Japan, 1933–1945] Check |url= value (help). Tokyo: Kodansha International. p. 42. ISBN 4-7700-2754-0. ^ a b Shimomukai, Tatsuhiko (30 June 2000). The Review of the Study of History : Shigaku Kenkyu. 広島史学研究会. ^ John T. Kuehn (15 January 2014). A Military History of Japan: From the Age of the Samurai to the 21st Century. Praeger. p. 34. ISBN 978-1-59228-720-8. ^ Nagayama, Kokan (1997). The Connoisseur's Book of Japanese Swords. Kodansha International. p. 21. ISBN 4-7700-2071-6. ^ Perrin, Noel. Giving Up the Gun: Japan's Reversion to the Sword, 1543–1879. Boston: David R. Godine, 1979. ^ "Sword Robbers Strike Third Shop". IC Coventry. ^ "Samurai swords to be banned after spate of horrific sword murders". MailOnline. Associated Newspapers. 2007-12-11. Retrieved 2011-12-29. The move will be seen as an attempt to counter the rise in popularity of Samurai swords among violent criminals. […] Only two months ago thieves armed with a similar weapon robbed a security van of £40,000 in Northampton. ^ a b Irvine, Gregory (2000). The Japanese Sword: The Soul of the Samurai. London: V&A Publications. ^ Tanaka, Fumon (2003). Samurai Fighting Arts: The Spirit and the Practice. Kodansha International. p. 35. Irvine, Gregory (2000). The Japanese Sword, the Soul of the Samurai. V&A Publications. Kapp, Leon (1987). The Craft of the Japanese Sword. Kodansha Intl. Ltd.
Kapp, Leon. Modern Japanese Swords and Swordsmiths: From 1868 to the Present. Perrin, Noel (1979). Giving Up the Gun: Japan's Reversion to the Sword, 1543–1879. Boston: David R. Godine. Robinson, H. Russell (1969). Japanese Arms and Armor. New York: Crown Publishers Inc.
Sinclaire, Clive (2001). Samurai: The Weapons and Spirit of the Japanese Warrior. The Lyons Press. Sinclaire, Clive (2009). Samurai Swords. Chartwell Books, Inc.
Yumoto, John M (1958). The Samurai Sword: A Handbook. Boston: Tuttle Publishing. Wikimedia Commons has media related to Swords of Japan. This page was last edited on 12 April 2019, at 15:46 (UTC).